I admit it, I don't always remember to clean my garden tools when I'm done with them. Actually, I rarely remember! Unfortunately that means that as I get all my hand tools out for my spring gardening, that many of them are rusty. I guess it's time to clean the rust off the garden tools. Luckily, it's not as hard as it sounds. Rust is another name for iron oxide, which occurs when iron or an alloy that contains iron, like steel, is exposed to oxygen and moisture for a long period of time. Also known as: evidence I didn't clean and dry my tools before putting them away. 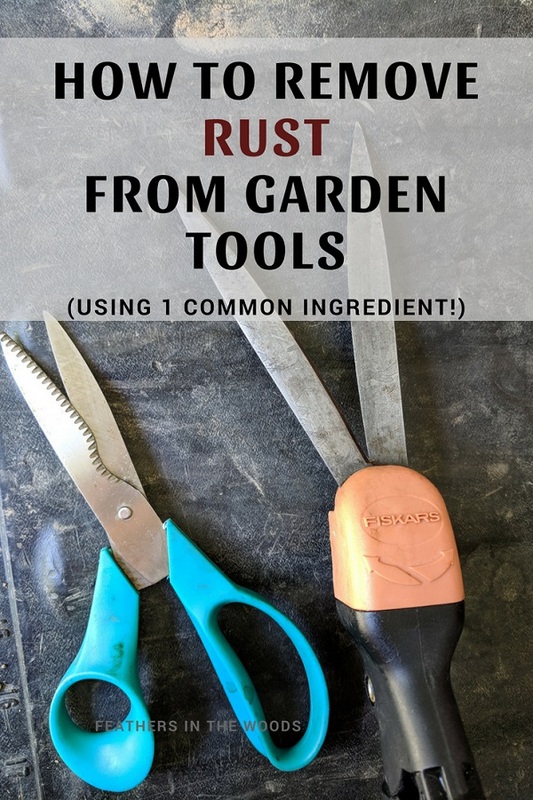 Rust can be removed from large garden tools with a grinder or in milder cases a wire brush and steel wool. I only needed to remove rust from hand tools so I opted to use an acid instead. While there are many acids that could do the job of removing rust, white vinegar is around 5% acetic acid and is already in my pantry. Plus I'm cheap, so that's what we're using today! I'm all about being frugal and vinegar is the most frugal cleaner I know of. Dampen 2 paper towels with white vinegar. Wrap paper towels loosely around tools. 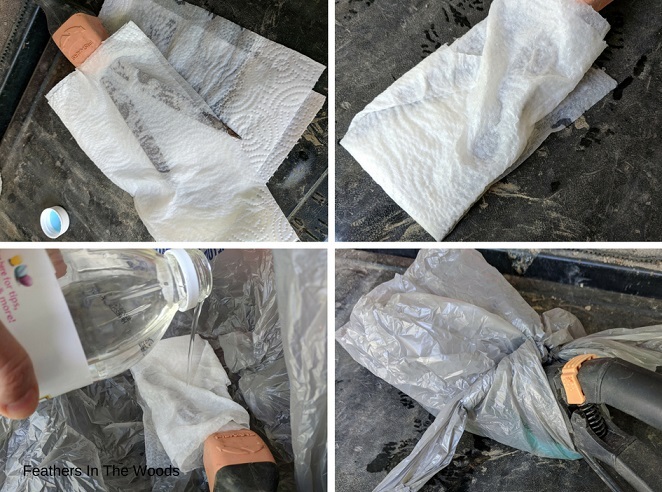 Place tool with damp paper towels into a grocery bag. Pour more vinegar on the towels. You want them pretty wet. Allow to sit awhile. For small amounts of rust an hour will do. 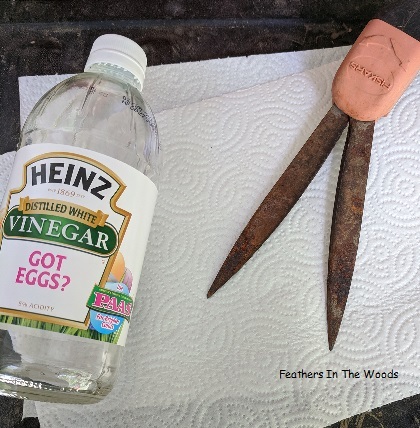 For heavy rust, the tools might need to soak overnight. After an hour, open the bag and remove tools. Unwrap from wet paper towels. Using a wet sponge, wipe the tools off. With light rust the tool will wipe clean. You may want to scrub them a little with a scrubbing pad. Wash tools with mild dish soap to remove all traces of the vinegar and dry well. This worked great for the little green shears but since my clippers hadn't been cleaned in at least 6 years, I ended up soaking them again, overnight. 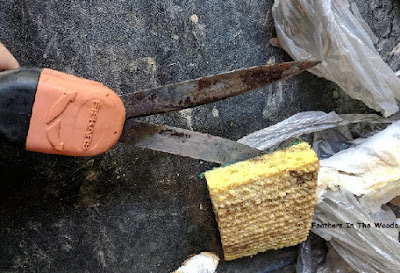 After soaking overnight in the white vinegar, the rest of the rust buffed off easily by using the rough side of a scrub pad. I like to wipe the metal parts of my tools down with olive oil after they're clean and dry. Many people use boiled linseed oil, mineral oil or 3-in-1 oil. Whichever oil you choose to use, a very small amount on a paper towel rubbed into the surface is all you need. 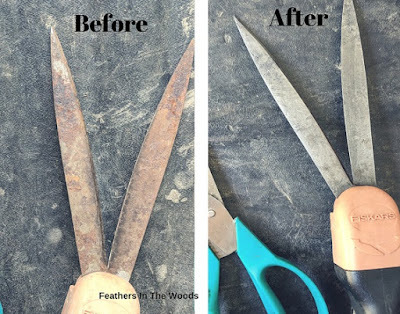 To maintain your tools, rinse the dirt off after each use and dry with a soft cloth before putting your garden tools away. If the tools don't have visible dirt on them, just give them a wipe with the soft cloth and store them away from moisture. Many people recommend storing garden tools in sand mixed with oil, but I don't find it necessary as long as they're stored in a dry place. Happy gardening!